We’d love your help. 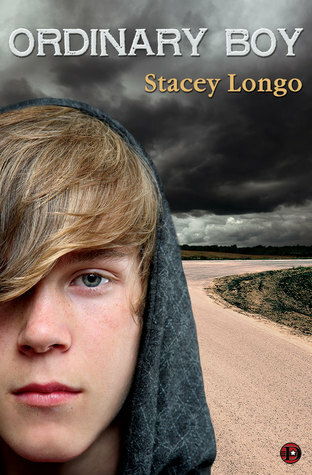 Let us know what’s wrong with this preview of Ordinary Boy by Stacey Longo. My name is Curtis Price. Until my extraordinary death, I live an ordinary life in the poor side of town in Osprey Falls, Maine, with my mother and older sister. I am the boy that nobody sees, ignored in the shadows of the hallway. I am the kid that is picked last in gym. I am the student that is never called on in class to answer the question, and, after a while, I stop bo My name is Curtis Price. Until my extraordinary death, I live an ordinary life in the poor side of town in Osprey Falls, Maine, with my mother and older sister. I am the boy that nobody sees, ignored in the shadows of the hallway. I am the kid that is picked last in gym. I am the student that is never called on in class to answer the question, and, after a while, I stop bothering to raise my hand. It is not until my stepfather shoots me that I am finally—finally—noticed. To ask other readers questions about Ordinary Boy, please sign up. In "Ordinary Boy" you meet ordinary people who lead As a rule when I think about Stacey Longo's writing I think of words like "Terrifying and scary!" but the only thing that's terrifyingly scary in her new book is how well she - as an adult female - has managed to get into the mind of a teenage boy. Even though the opening of the book tells us that Curtis Price is dead, Stacey does a terrific job of bringing him to life along with all of the nuances growing up as an outsider in the 80s entailed. Authentic... If I was to sum this novel up in one word, authentic would be the one. I am not typically one to read books without a clear direction or known plot, and initially I found the meandering storyline in this book a bit confounding in it's ability to draw me in and hold my focus. In the beginning I found the book choppy and disjointed, but I soon came to realize that Longo was expertly adapting the voice of the narrator to perfectly match his his evolving identity and narrative from an a Authentic... If I was to sum this novel up in one word, authentic would be the one. I am not typically one to read books without a clear direction or known plot, and initially I found the meandering storyline in this book a bit confounding in it's ability to draw me in and hold my focus. In the beginning I found the book choppy and disjointed, but I soon came to realize that Longo was expertly adapting the voice of the narrator to perfectly match his his evolving identity and narrative from an abrput 8 year old to a compassionate teen. As readers follow Curtis Price through the trials of growing up in the wrong part of town in rural New England, his story evolves from a focus on kickball to kissing and everything in between. The awkwardness of boyhood was perfectly captured in the the pages of a story written as though the author lived it, and it bares raw the sometimes excruciating realities of adolescent struggle for acceptance and belonging felt by many and expressed by very few. In Curtis, Longo captures the essence of what it is to be a shy, awkward, and unpopular kid with a tender side just looking to blend in. In his struggle to disappear into his own life, he touches the lives of so many in a way that he couldn't imagine. I'm familiar with Stacey Longo's short stories, which are simply brilliant. I love her tone, with perfect pacing, characters and delivery. So I was thrilled when I learned about her novel. Right from the very beginning I was lulled into Longo's world. I love how her story moves so effortlessly. Casual yet deliberate. Before I realized it, I was so engrossed in her town Ospey Falls and felt an immediate connection to her characters. And I'm not just saying that because I really like the story. It I'm familiar with Stacey Longo's short stories, which are simply brilliant. I love her tone, with perfect pacing, characters and delivery. So I was thrilled when I learned about her novel. Right from the very beginning I was lulled into Longo's world. I love how her story moves so effortlessly. Casual yet deliberate. Before I realized it, I was so engrossed in her town Ospey Falls and felt an immediate connection to her characters. And I'm not just saying that because I really like the story. It's Longo's natural pacing that pulls you right in before you even realize how attached you've become. The characters are developed so naturally that my connection to each and every one of them is so real. Several days later I'm still thinking about the characters. It's like I'm back in high school again, absent from my circle of friends, maybe because of a family trip out of town. The first thing I want to do when I walk in the door is reconnect with my friends and find out what everyone has been up to...in a frenzy and convinced that I've missed out on the best experiences in my lifetime. That's what this book does to you...it brings you right back and aching for more. If you like Stacey Longo's short stories, you'll love her novel! ORDINARY BOY is anything but ordinary. The down-to-earth, emotionally honest and ambitious sweep of this novel place it among such works as THE OUTSIDERS for its portrayal of a boy determined to overcome life’s burgeoning realities as he navigates his overwhelmingly awkward and yet unnervingly beautiful teenage years. Longo threads her own style of blunt, honest humor throughout this dark, dramatic work, showing that life can be funny and tragic at the same time, and adding colorful nuances that ORDINARY BOY is anything but ordinary. The down-to-earth, emotionally honest and ambitious sweep of this novel place it among such works as THE OUTSIDERS for its portrayal of a boy determined to overcome life’s burgeoning realities as he navigates his overwhelmingly awkward and yet unnervingly beautiful teenage years. Longo threads her own style of blunt, honest humor throughout this dark, dramatic work, showing that life can be funny and tragic at the same time, and adding colorful nuances that punctuate the realities in the poor side of town. The roller coaster of first love, the uncertainty of defining oneself, and the struggles against small-minded bullies unaware of their own shortcomings skillfully accentuate this engaging family drama. This book brought many memories and tears to my eyes. I grew up in the 80's in New England and it really hit home. It will make adults remember how they treated or were treated by their classmates and supposed friends. For a young adult book, it is more important to the 40-ish crowd. I highly recommend it, even with tears in my eyes, something a book hasn't caused in a long time. The book is amazing. It's the first book to have made me tear up. As a ghost story, Stacey Longo's ORDINARY BOY is extremely unusual as the only ghost does not show up until the book is more than three quarters finished. Then again, I'm not sure that ORDINARY BOY actually IS a ghost story -- at least not in the traditional sense. Throughout, Longo's prose is a delight to read. There's a smoothness to the words and a forward momentum that many authors would (and should!) envy. Her characters are both crisp and complex; though she paints many of them quickly and As a ghost story, Stacey Longo's ORDINARY BOY is extremely unusual as the only ghost does not show up until the book is more than three quarters finished. Then again, I'm not sure that ORDINARY BOY actually IS a ghost story -- at least not in the traditional sense. Throughout, Longo's prose is a delight to read. There's a smoothness to the words and a forward momentum that many authors would (and should!) envy. Her characters are both crisp and complex; though she paints many of them quickly and with few words, she somehow manages to also impart a depth and a reality to even the most minor of them. Nor does she make the mistake of fully explaining each and every motivation. Longo has enough confidence in her fictional creations to let them stand on their own without too obviously interfering. In the end, I suspect this entire novel is an attempt at metaphor, albeit an extremely accessible one rather than one which is obscure or difficult to fathom. The theme seems to be that the protagonist, Curtis, spends most of his life invisible until he is murdered. At that point, though he may be physically invisible, he realizes just how visible his life has actually been. It's an interesting, if simple, conceit. And Longo largely pulls it off. However, when choosing a theme like this, an author all too often finds themselves creating a paradox for the sake of keeping the novel interesting. Longo is no exception. Curtis is, at times, far too vibrant a character for the reader to sympathize with his feelings of being ignored, overlooked or a "nerd" as he puts it. It is an ironic example of a writer's strengths working against them. Thus, thematically, I think ORDINARY BOY ultimately fails to make its point effectively. However, that does not mean that it is not a very good, very well written and enjoyable novel. In fact, insofar as the story itself, Longo effortlessly keeps us interested for the duration. Even better, as an mature reader, I remained vested in the characters even when their problems and issues were, as they tend to be in YA novels, far different from most adult concerns. Though ORDINARY BOY does not entirely succeed, it does not truly fail on any level. In fact, the only overt flaw I can take issue with is that Longo seems to have a slight difficulty matching her narrator's "voice" with his age at certain points in the story. For the first several chapters of the novel, while Curtis ostensibly is a small boy, his vocabulary is not only impressive, but he seems a trifle too mature and knowing to be entirely authentic. By the same token, a certain immaturity of language and attitude persists once the character is old enough to drive. But these are minor squabbles at most, easily overlooked and forgiven. As adults, we may not take very much away from this novel. Yet, I surmise that YA readers will find much within it that they can relate to and which resonates with them. If you are a fan of YA books, or if you are a young person who has felt the alienation and "invisibility" of high school, I can heartily recommend ORDINARY BOY. I have read Stacey Longo’s work before, In Insanity Tales II and Secret Things, and what always strikes me is how incredibly human and realistic her characters are. Stock characters have no place in her writing, but those with a lot of heart do. I will freely admit, I am not normally drawn to this style of book . Where are the vampires and ghosts? And if I hadn’t met Longo and wanted to support her by purchasing her books, I may never have. But I am glad that I read it. And I’m particularly glad I have read Stacey Longo’s work before, In Insanity Tales II and Secret Things, and what always strikes me is how incredibly human and realistic her characters are. Stock characters have no place in her writing, but those with a lot of heart do. I will freely admit, I am not normally drawn to this style of book . Where are the vampires and ghosts? And if I hadn’t met Longo and wanted to support her by purchasing her books, I may never have. But I am glad that I read it. And I’m particularly glad that I read it at this exact moment in time. Because I have been feeling very adrift of late and this book has left me feeling lighter, relieved even. If nothing else, you should read this book for the masterfully crafted characters. There is a tragic beauty found in each and every flawed one of them that literally had me crying my way through the last few chapters of the book. It felt so honest. The story follows Curtis, the narrator, through his childhood, into his teenage years and a little past where he should have ended. Through broken bones and heartache, past the struggles of social acceptance into love. It’s a very real and captivating slice of life story about a low-income kid growing up in New England. There are a lot of moments in this story that will stick with me, but the one that hit me hardest was the funeral. I don’t really want to share the details and tear the wind out of its sails before you read it, so I will say this: It gave me hope. It made me feel like my existence and time on this planet was validated. And that each of us will be remembered. In her debut novel, Stacey Longo explores the life of the title character, who has nothing outstanding going for him. And yet the author makes this life compelling, and keeps us interested, a true test of good writing. We are pulled into the minor victories and losses that come as the protagonist struggles with everyday life. Just a kid coping with the hand Fate has given. But one that draws you in, and makes you care. I rarely wander far from the Horror-genre, but very much enjoyed this book. It was a well-told statement (example?) of how an "Ordinary Boy" can have an extraordinary impact on the people in their lives. I'd love to write a clever Review, but that's over-reaching my abilities. Would make a very good movie. 3.5. Really enjoyed Curtis' voice. Feel this is for an older young adult (to adult) as it uses language I have not seen in other YA novels.